Sarah Bettey Photography: I miss Trillium Lake!!!! This photo was taken this time last year. I am going through some serious withdrawls -- from a place! Trillium Lake is my favorite place ever. When I was a kid my family would play here on sunny summer days. My husband and I got married on its banks. We camp and go on day fishing trips here as much as possible throughout the open season. But from about October until late May or early June, it is only accessible via snowshoe or snowmobile (Next year, I hope to try this). However, as of now, the road to the lake is still closed and we are waiting for the last of the snow to melt away. We have camping reservations for June 10th to celebrate our 2 year wedding anniversary. The website says the campground will open on June 9th. Talk about cutting it close! Keep your fingers crossed for us!!! Trillium Lake, I miss you! 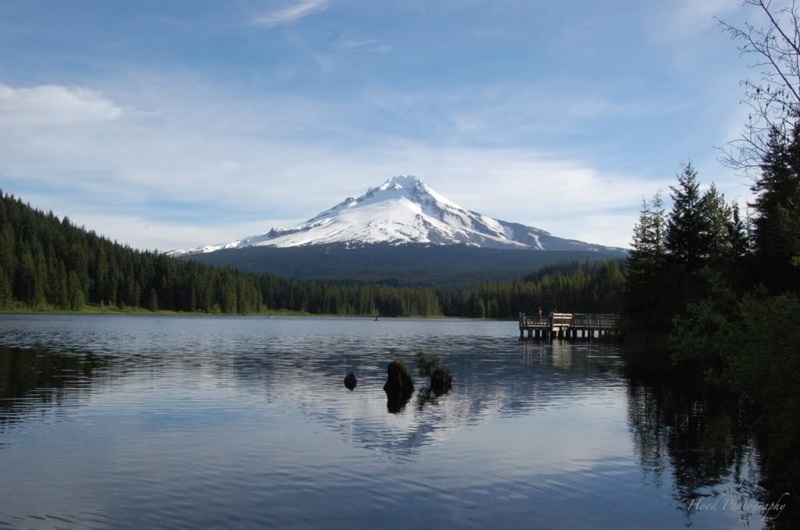 Just imagine how thrilling the first trip to Trillium Lake this year will be! What does it take to satisfy you? That’s what it takes to satisfy me! a lake named after trilliums, in Oregon, in the mountains... now I am really missing the place. That is a beautiful shot! I really like the reflection on the rippling water.